* Women/trans/femme. As always, those identifying as women, trans, and/or non-binary are welcome at Women Bike PHL events. If you are a W/T/F* cyclist interested in bike racing in any way shape or form and want to talk to some real live people about it, and/or you want to learn about cycling-related events and volunteer opportunities, and/or you want to donate some old gear and win some sweet new gear, we have your plans for next Friday night under control. 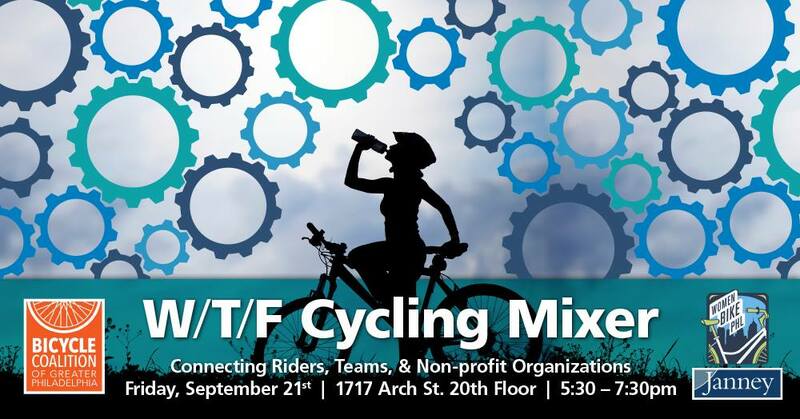 On September 21st from 5:30-7:30pm, BCGP will be holding our first W/T/F Cycling Mixer for folks to come learn about race teams, nonprofit programs, and beginner-friendly events in the region. Thanks to our sponsor and host Janney Montgomery Scott LLC, the event is free to attend and snacks and drinks will be provided, so you can put your cash toward supporting the nonprofits that will be in attendance: Bicycle Coalition Youth Cycling, Neighborhood Bike Works, and Little Bellas. Prizes up for grabs include: a Basic Tune Up and an Essential Fit from Cadence Cycling & Multisport (both $75 value) and goodies from Little Bellas and from GoCycling (including a Cooper River Cyclocross/CRCX entry)! We’ll also have a drop off spot for any new or lightly used cycling gear and bike parts that you want to donate to BCYC. The majority of the event will just be casual conversation (and snacking! ), but we will have a short program starting around 6:15pm by event organizers and sponsors to make sure you’re oriented to the space and don’t miss any opportunities to connect. RSVPs close September 14th, so let us know you’re coming ASAP!